We’ve been paying loads of attention to lightweight, compact, and sporty (Tesla, much?) electric vehicles, but the EV revolution is also taking place in heavy duty vehicles as well. We’re not talking hybrids, we’re talking about 100% plug-in EVs like this new electric garbage truck from Motiv Power Systems that just made Chicago the first city in North America to haul trash in an EV. If you can run a garbage truck complete with compactor off an electric battery pack, you can run just about anything. What now, EV haters? We’ve been following the Motive electric garbage truck around since it was a glimmer in the company’s eye. Back in 2012, the company announced that it would make Chicago the first US city to get a fleet of all-electric garbage trucks, and it looks like they’re on track. The 2012 announcement covered a $13.4 milion contract to add 20 electric garbage trucks to the city’s 600-strong fleet over the next five years. Motiv Power Systems is better known for its forays into the electric school bus field, and it apparently won the Chicago contract based partly on the success of its pilot project involving an electric bus in California. The Motiv secret sauce is a flexible system for pulling mix-and-match, off-the-shelf components together with its proprietary technology in order to get the biggest bang for the least bucks. That’s pretty much the opposite of the Tesla Gigafactory approach, but hey, whatever works. Motiv also looked at hybrids and compressed natural gas as alternatives, but determined that the all-electric approach was more cost effective. If the garbage truck can get anywhere near the savings that Motiv calculates for its electric buses, Chicago could score big. According to Motive, between cheap fuel and low maintenance a single electric bus can save $11,000 per year over its diesel counterpart. It looks like Chicago is just the beginning for Motiv. Last summer we took note when Motiv nailed down $7.4 million in funding from the Magness Investment Group to ramp up its electric vehicle operations across the board. 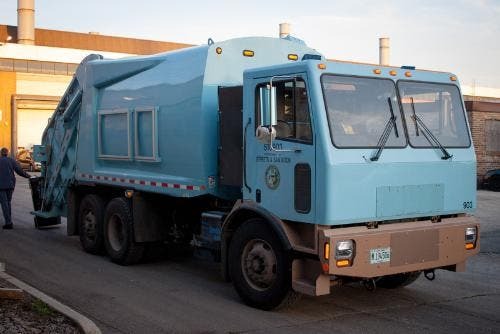 As for the new electric garbage truck, Chicago plans to run its new Electric Refuse Vehicle (ERV) on a residential refuse and recycling route topping off at 60 miles and a 9-ton payload, eliminating the use of about 2,688 gallons of diesel per year. That includes operating the compactor with a compression capacity of 1,000 pounds per cubic yard. If you live in Chicago, stop by the CALSTART High-Efficiency Truck Users Forum Ride and Drive on September 23, because you might get a chance to hop aboard for a ride. Yes, apparently the City of Chicago is inviting the public on ridealongs, which is the right thing to do because…wait for it…we built this electric garbage truck! Yes, we did. The Motiv electric garbage truck contract was supported partly by $15 million in federal funding for a clean fleets initiative in Chicago, which covers light and medium duty vehicles as well as heavy duty vehicles.